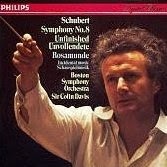 Colin Davis died 14 April 2013 in London at the age of 85. When Colin Davis first conducted the Boston Symphony Orchestra in 1967, he was something most players had not experienced. He was young, born 1927. Not as young as the infant Ozawa, born 1935, but light years from the conductors the older players had grown up on, Pierre Monteux and Serge Koussevitzky and Charles Munch. He looked young too, with luxuriant chestnut curls, and if not exactly hippie, a bit exotic in dress. My first glimpse of him was more sheep than man. I’d been sent by my boss, the Boston Globe music critic Michael Steinberg, to interview him after a morning rehearsal for his debut concert. He wore a raggedy sleeveless fleece down to his knees. Persian, he said, from his honeymoon in his beloved Shamsi’s homeland. So different from the “suits”—Koussevitzky, Munch, Leinsdorf. Our Munch was Mr. Berlioz. Here was the young challenger: by the time he was named principal guest in Boston, Colin was conducting Les Troyens at Covent Garden. What was the appeal of Berlioz? I asked. There was an awful pause, I wincing at the stupid question. Then pppp—the soft voice we came to know—a torrent of reasons, “virile,” not a word I’d heard musicologists much use, and “passionate,” chief word in Colin’s lexicon. He would come late to Mahler but toss out certain of the symphonies he felt were merely showing off or lazy. Yes, Shostakovich was loud and noisy, but so meant. One pleasure in getting old, he said, was never having to conduct music he didn’t value. Rachmaninov topped the list. He would have liked to have done one more Ring, though he detested Wagner the man. He was once asked by the Boston press to compare the BSO to his other orchestras. As principal guest, 1972–84, and frequent guest 2003–10, he was of course at the mercy of a standing orchestra. The Boston players he particularly admired were principal bassoonist Sherman Walt and principal clarinetist Harold (Buddy) Wright, and timpanist Everett (Vic) Firth, who advised his students to listen to the violins. His tactful answer to the question was he thought the London orchestras were without peer, but even they would concede the special quality of the Boston strings. By the time Colin returned to Boston in 2003 the old generation of orchestra trustees and management had passed. When Henry Lee Higginson founded the BSO in 1881, thanks to lucky investments in Michigan copper mines, he ran it pretty much himself, choosing the conductors, paying the bills, commissioning Symphony Hall as its new home. In Boston, “Friday Symphony” was a ritual, packed with society ladies and music teachers and speckled with lawyers and judges and book publishers, though by Colin’s day the line of limos waiting for their ladies had gone. But the tradition prevailed into the 1960s that the trustees ran things in the plain Higginson style. Colin was twice offered the job of music director by BSO trustee president Henry B. Cabot. Quintessentially Boston, spruce, spare, with steel-rimmed glasses and a trim mustache, Cabot was taciturn but music loving (his favorite composer he pronounced Mo-ZART) and in the Boston way wore tennis shoes with his blue summer seersucker suit. In his mind there was no higher calling than to lead the orchestra, and he tracked Colin to the Edinburgh Festival and, in the frugal Boston manner, wooed him over breakfast porridge. Victorians like Higginson thought big, and Victorian Boston had a large idea of itself: the Athens of America, the Hub of the Universe, but it was tiny, and still is, 600,000 people, a tenth of London, and it lacked the good theater and opera and food that Colin loved. “I’m a man of the theater,” he told me once. So Boston’s loss was Covent Garden’s gain, and thanks also to his years in Munich and Dresden we certainly got a greater Colin back for his millennium years in Boston. But the early years were full of good things, the sense of theater and occasion already there. This made his Stravinsky special, ditto the Haydn that Michael Steinberg loved for the “energy, grace, lyricism, [Colin’s] delighted response to the winged play of Haydn’s mind, a touch of something like swagger.” Till Colin, Messiah in Boston was solemn and slow, what George Bernard Shaw had likened elsewhere to the “lumbering family coach.” Colin’s astonished for its lithe passion. He liked Ravel and Debussy. He restored Sibelius to the BSO repertoire, the atmospheres of inner life still palpable in those early LPs. And he did The Dream of Gerontius twice, in 1982 and 2008. The BSO knew little English music, and religious music meant the usual Haydn and Beethoven Masses as well as the Bach Passions, Protestant Munch’s territory (he’d been concertmaster of the great Leipzig Gewandhaus under Furtwängler but did not like his Bach). Players still remember Colin’s tender projection of this Elgar as a world of belief they had never imagined. He had worried the howl of the tormented Soul would not go over. Quoting a line from the text, he joshed that the audience might “use well the interval” and flee the hall. For some Boston WASPs this Elgar might have been too confessional, too Catholic. But, no! And I remember a Jewish violinist beside himself in wonder at what he had just played that afternoon. The Angel of the 1982 performances was Jessye Norman. He liked our comestibles, American bacon, our lima beans, and our drink, our whiskey, “Uncle Jack,’ as he called our Tennessee sour mash. He added to the hilarity of BSO dinner tables. For a man who tended his own arboretum in Suffolk, England, the only possible 65th birthday gift from players and friends was planting a sweetgum on the Commonwealth Avenue Mall to give him roots in Suffolk County, Boston. Margo Miller wrote for the Boston Globe, 1962–1999. As a Boston Symphony summer staffer at Tanglewood, she heard her first Berlioz in 1954 and 1955, when Charles Munch continued the 150th birthday celebration begun in Symphony Hall. She lives in Major Higginson’s house on Commonwealth, and she, too, has an honorary tree in the Commonwealth Avenue Mall. Extracted from the Colin Davis memorial issue of the Berlioz Society Bulletin, no. 190 (June 2013), ed. David Cairns, pp. 46–50.